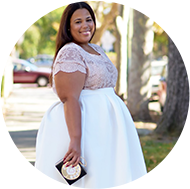 One thing that I have remained true to in my personal style and as a plus size blogger is a hi/low shopper or in other words mixing the inexpensive with the expensive. For me, I'm a girl you loves to peruse the to see what's new at Target just as much as I love seeing what's new Nordstrom and I love mixing that love into one outfit. I think it's an awesome way to make everything in your outfit look high end. For me, this is how I created my personal style. Mixing hi/low is a little more than mixing price tags, but more about mixing quality and fabrics. You can achieve your high thrifted items, clearance items, etc that carry a lower price tag, but scream things like fabulous details, intricate seams, and amazing fabric. It takes a bit more work, but it is possible. The low is the easy part. Places like Target, JCPenney, Forever21, H&M, and even Amazon. Style Notes: The pants are in a 4x. They have no stretch. The top is, unfortunately, sold out. I got it at a trunk sale, but listed the original seller at the bottom.